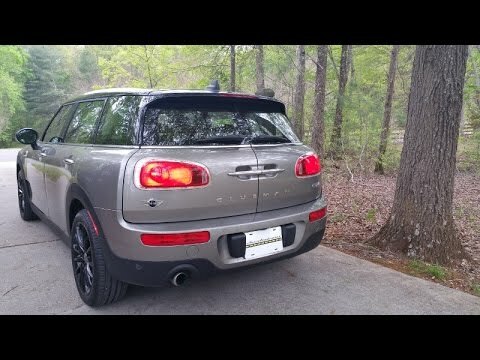 The 2016 Mini Cooper Clubman is all-new, and with the new sheetmetal comes a newfound sense of size, refinement and driving sophistication that previously haven't been part of the Mini brand. However, the good news is that the new Mini Clubman is just as fun and quirky as its predecessor, just a whole lot bigger. It is very affordable and has the latest technology. I love the sunroof, it is especially nice on cool mornings to have open on my way to work. The size of my car is perfect. I can get into small spaces easily, yet my car is roomy and very comfortable. It drives very smooth, hugging curves. The low gas consumption is wonderful and it cost me less than $10 per week to go to work. Finally in the winter the heated seats are the best. I love my mini clubman in British green with white racing stripes. This car handles like a dream, has great acceleration. . . Style lines are awesome and interior features excel beyond all words. Onboard smart brain keeps everything running smoothly and the Bluetooth is a definite selling feature. . Paint job is nifty and I just love this little gem to pieces!! Love mostly everything about this car except for the tires. I don't like the run flats. Within a year I had already had to replace all my tires. I would prefer a spare tire come with the vehicle. Other then that I haven't had problems. Have only had 2 years. BMW of North America, LLC (BMW) is recalling certain model year 2016-2017 MINI Clubman vehicles manufactured August 19, 2015, through July 14, 2016. The side curtain air bags for the front seat occupants may deploy in the intended positions in the event of a crash. As such, these vehicles fail to comply with the requirements of Federal Motor Vehicle Safety Standard (FMVSS) number 226, "Ejection Mitigation." If a side curtain air bag does not inflate as intended in the event of a crash, there is an increased risk of injury to the front seat occupants. BMW will notify owners, and dealers will modify the driver and passenger side curtain air bag covers, free of charge. The recall is expected to begin September 12, 2016. Owners may contact BMW customer service at 1-800-525-7417 or email BMW at CustomerRelations@bmwusa.com. Curt Manufacturing LLC (Curt) is recalling certain Class 1 trailer hitches, part number 11451, sold for installation on 2016-2018 Mini Cooper Clubman and Countryman vehicles. The vehicles may have inadequate structure points for the trailer hitch mounting, causing the hitch to sag under to certain loads and possibly separate from the vehicle. If the trailer hitch sags or separates from the vehicle, there would be an increased risk of a crash. Curt will notify owners, and dealers will provide a replacement hitch, free of charge. The recall began on October 20, 2017. Owners may contact Curt customer service at 1-800-798-0813.